What effect could Stephen Spielberg’s film, Munich" have on public attitudes towards Israel? See also Olympics, concerning the refusal to commemorate the events of Munich at the London 2012 Olympics. While the movie has ceased to be news, the issues of commercial cinema affecting public perception and sympathy remain relevant. The following comments were gleaned from a Google search on "Stephen Spielberg" and "Munich". Steven Spielberg's wants his new film Munich - which he describes as "a prayer for peace" - to provoke an international debate about terrorism. It deals with the aftermath of the capture and murder of 11 Israeli athletes by Palestinian terrorists at the Munich Olympic Games in 1972. The 160-minute film opens with the statement that it is "inspired by real events" and centres on a five-man assassination squad, sanctioned by Israeli president Golda Meir, who are ordered to kill 11 Palestinians responsible for the atrocity at the Munich Games. Spielberg seems less interested in chasing awards than in using the film to provoke an international debate about terrorism. "Viewing Israel's response to Munich through the eyes of the men who were sent to avenge that tragedy adds a human dimension to a horrific episode that we usually think about only in political or military terms,"
"I wanted this film to be in memory of [the Israeli athletes], because they seem to have been forgotten," "The silence about them is getting louder for me every four years." "By experiencing how the implacable resolve of these men to succeed in their mission slowly gave way to troubling doubts about what they were doing, I think we can learn something important about the tragic stand-off we find ourselves in today." "The biggest enemy is not the Palestinians or the Israelis," he told Time. "The biggest enemy is intransigence. I don't think any movie or book or any work of art can solve the stalemate in the Middle East today. But it's certainly worth a try." "Zionism is not the right answer" and "the creation of Israel was "a mistake," and that "establishing a state means f---ing people over." "I never like to draw lessons for people," he said of how his script deals with the Middle East question. "It's not an essay; it's art." The fakery is everywhere, isn't it, though in this instance it nicely captures the self-importance of this pseudo-controversial film. The makers of Munich seem to think that it is itself an intervention in the historical conflict that it portrays. The film is powerful, in the hollow way that many of Spielberg's films are powerful. Spielberg knows how to overwhelm. The film is soaked in the sweat of its idea of even-handedness. Palestinians murder, Israelis murder. Palestinians show evidence of a conscience, Israelis show evidence of a conscience. Palestinians suppress their scruples, Israelis suppress their scruples. Palestinians make little speeches about home and blood and soil, Israelis make little speeches about home and blood and soil. Palestinians kill innocents, Israelis kill innocents. All these analogies begin to look ominously like the sin of equivalence, and so it is worth pointing out that the death of innocents was an Israeli mistake but a Palestinian objective. The screenplay is substantially the work of Tony Kushner, whose hand is easily recognizable in the crudely schematic quality of the drama, and also in something more. The film has no place in its heart for Israel. Israel's consul-general in Los Angeles has lambasted Steven Spielberg's film about the 1972 Olympic massacre in Munich as a "superficial", "pretentious" and "problematic" work that draws an incorrect moral equation between Mossad agents and Palestinian terrorists. "As a Hollywood movie, I assume that it will be defined as a well-made film, but from the standpoint of the messages it sends, the messages are problematic." Steven Spielberg's long-awaited movie, ``Munich,'' about the brutal slaying of 11 Israeli athletes at the 1972 Olympic Games, opens next week. I went in feeling certain that Spielberg, who has donated millions of dollars to Jewish causes and charities, would make a pro-Israeli movie, if not a polemic. What are movies for if not to have the good guys triumph over the bad ones? And the bad ones who invaded the dorms housing innocent athletes, at the very Games whose purpose is to bring us together, couldn't be more blood-thirsty monsters. Ilana Romano, whose weightlifter husband Yosef was the first Israeli sportsman gunned down during the 1972 guerrilla raid, said she attended an exclusive courtesy screening of "Munich" in Tel Aviv this week along with fellow widow Ankie Spitzer. "For me, it was important that the film does no dishonor to the memory of the murdered athletes, nor to the image of the State of Israel. Both my criteria were satisfied," she said. Veterans of Israel's Mossad intelligence agency came out of the cold to question Spielberg's sourcing after it emerged that Munich was based in part on "Vengeance," a 1984 book drawn from the purported confessions of a former assassin who said he broke rank in protest at the retaliations policy. David Kimche, a former Mossad deputy director. "I think it is a tragedy that a person of the stature of Steven Spielberg, who has made such fantastic films, should have based this film on a book that is a falsehood,"
Mohammad Daoud, Black September mastermind has also questioned the basis for Spielberg's portrayal. The film has no place in its heart for Israel." The film proclaims that terrorists and counter-terrorists are alike. "using Munich as a means of commenting, in your own way, on the situation of the United States in a post-9/11 reality." "Spielberg has to distort reality to fit his preconceptions." "In Spielberg's Middle East the only way to achieve peace is by renouncing violence. But in the real Middle East the only way to achieve peace is through military victory over the fanatics, accompanied by compromise between the reasonable elements on each side." The first and most important thing to say about Munich, Steven Spielberg's new film, is that it is a very good movie--good in a particularly Spielbergian way. By which one means that it has all the virtues we've come to expect when he is working at his highest levels. It's narratively clean, clear and perfectly punctuated by suspenseful and expertly staged action sequences. It's full of sympathetic (and in this case, anguished) characters, and it is, morally speaking, infinitely more complex than the action films it superficially resembles--pictures that simply pit terrorists against counter terrorists without an attempt to explore anyone's motives and their tragic implications. There is an entirely fictional scene in the movie in which Avner and his Palestinian opposite number meet and talk calmly, with the latter getting a chance to make his case for the creation of a homeland for his people. That scene means everything to Kushner and Spielberg. "The only thing that's going to solve this is rational minds, a lot of sitting down and talking until you're blue in the gills,"
Concerns about the film were first ignited when the director, revered by millions for Schindler's List and activity related to preserving the memory of the Holocaust, enlisted playwright Tony Kushner to redo the script. An extreme detractor of Israel, Kushner has repeatedly said the creation of that nation was a "mistake" and, for example, associates himself (as an Advisory Board member) with the Jewish Voice for Peace, a radical organization advocating divestment and boycott campaigns against Israel. Kushner's commentary reflects little sympathy for the suffering of Israel in the face of Arab aggression and rejectionism. Thus, in the spring of 2002 at the height of the terrorist slaughter of Jews in Israel, Kushner denigrated the country and other Jews who did not likewise excoriate Israel. In a Chicago Tribune article he referred to "the shame of American Jews" for not denouncing Israel. In a London Times article that May, as Israel attempted to defeat the terrorists, Kushner reviled both American president George Bush and Israel's Prime Minister Ariel Sharon. He said: "...Bush? Sharon? Nine months have passed [since 9/11] and look at the mess the feckless blood-spattered plutocrat and the unindicted war criminal have wrought in the Middle East." Kushner demanded of Sharon: "good faith, not ethnic cleansing and military occupation cloaked in fundamentalist misreading of Scripture." While the prize-winning writer did in passing "deplore suicide bombings," he saved his tough adjectives for Israel, saying: "I deplore the brutal and illegal tactics of the Israeli Defense Forces in the occupied territories. I deplore the occupation, the forced evacuations, the settlements, the refugee camps, the whole shameful history of the dreadful suffering of the Palestinian people;"
Blurring cause and effect, perpetrator and victim, in familiar moral equation, he lamented: "One injustice breeds new generations of injustice. Suffering rolls on down through the years, becomes a bleak patrimony, the only inheritance for the disinherited, the key to history ... the only God is the God of Vengeance." In the Time interview, Steven Spielberg had this to say about Israel and the Palestinians: "I'm always in favor of Israel responding strongly when it's threatened. At the same time, a response to a response doesn't really solve anything. It just creates a perpetual-motion machine...There's been a quagmire of blood for blood for many decades in that region. Where does it end? How can it end?" The troubling dimension of Munich is the imposition of fictional events and fabricated sentiment full of distorted political notions on a grave, real-life conflict by an influential movie maker whose wide-screen creation will likely be taken by many viewers as essentially true. Kushner is on record uttering wildly false characterizations of Israel and Spielberg's comments disturbingly echo some of the same. While both aver that Israeli "responses" are counterproductive, "a quagmire of blood for blood," they are wrong. Israel's measures have emphatically succeeded in reducing terrorism, a reality the movie's creators ignore. In the recent terror war, the combined effect of intelligence, military action and the security barrier (which Kushner calls on Israel to remove) have dramatically reduced the violence. Secondly, according to Time reviewer Richard Schickel, commenting on the movie, a high point is a fictional scene in which the lead Israeli meets a PLO member "with the latter getting a chance to make his case for the creation of a homeland for his people." As though the conflict is simply over a Palestinian homeland. In a recent sermon, a PA-employed cleric declared: "We have ruled the world before, and by Allah, the day will come when we will rule the entire world again .... We will rule America ... [and] Britain and the entire world -- except for the Jews. The Jews will not enjoy a life of tranquillity under our rule .... Listen to the Prophet Mohammed, who tells you about the end that awaits Jews. The stones and trees will want the Muslims to finish off every Jew." "I certainly feel that if filmmakers have the courage to talk about these issues - whether they're fictional representations of real events or are pure fiction or pure documentaries - as long as we're willing to talk about the real tough, hard subjects unsparingly, I think it's a good thing to get out in the ether." Tackling Spielberg's "Munich" forced Williams to do a musical 180, he says. "It couldn't be more different from 'Geisha' in ambiance and texture." For it, he created "a kind of prayer for peace, a lyrical composition associated with Avner (Eric Bana) and the home he leaves behind in Israel," and another theme for solo voice and orchestra "that accompanies one of several flashbacks to the tarmac at Munich, and also one of several scenes that recall the abduction of the Olympic athletes from their rooms at the Olympic Village" in 1972. Lisbeth Scott, the vocalist on "The Passion of the Christ," is the soloist. Searching for an authentic Palestinian sound, Williams employed the oud, a Middle Eastern lute, and added the cimbalom, a Hungarian zither, as well as clarinet and strings for "an almost fantastically Oriental quality," he says. Stephen Spielberg is widely respected and has established Jewish credentials for "Schindler’s List", but does that make what he has to say in this film worth taking notice of? He has done what he does best, in making a movie, which tells a story effectively. Being a top film maker does not qualify Spielberg to offer a simplistic solution to the conflict between Israel and the Palestinians. Spielberg may be a Jew, but he does not choose to live in Israel but to live and work in Hollywood, USA. As such he can better be viewed as part of the secular, liberal world which believes that compromise and imposing a moral equivalence (without making judgments concerning right and wrong) can be the solution to every conflict. What matters is whether the story he tells is a true representation of the situation it seeks to explain, and what effect it will have when it is released. "Schindler’s List" was a safer film as a memorial to the victims of the holocaust, but Munich is attempting more than memorializing the victims of the Munich massacre. "Schindler’s List" did not try to equate the Jews and the Nazis or to propose naïve solutions to profound problems. 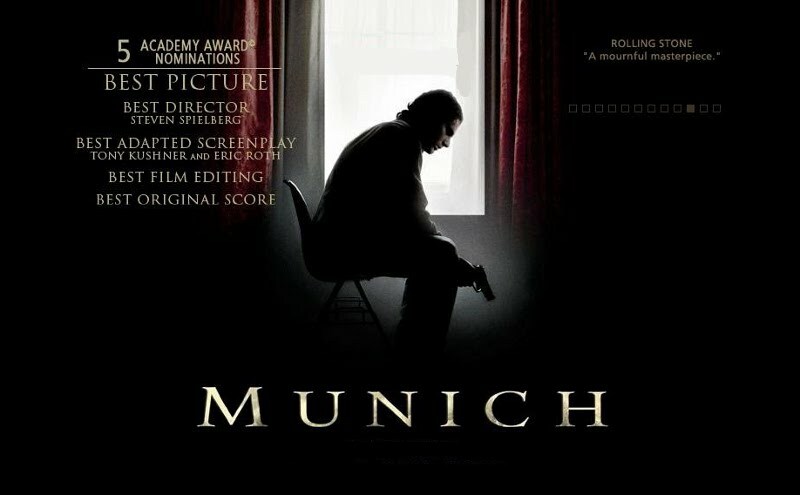 "Munich" is an attempt to be part of a solution to the conflict in Israel. This film goes to great lengths to generate equal sympathy for Israelis and Palestinians by avoiding any differentiation between the terrorists and their victims. It could also be that the sympathy generated for both the Israeli and Palestinian characters is focused on what the state of Israel has done to them. Either way, Israel looses! The fact that this is a well made film with a strong emotional impact, heightened by what is reported to be an excellent score by John Williams, will help to bring people to accept Spielberg's point of view and the solution he offers, however wrong it is. John Williams' efforts to produce an "authentic Palestinian sound" by using a Middle Eastern Lute, a Hungarian zither, European clarinet and strings suggests that the music will synthesize an artificial Palestinian national identity, with its claims of victimhood and loss of land, to underscore and reinforce the visual storyline. This film seems certain to reinforce the prejudices of those who hate Israel.